The catastrophic fire at Paris's Notre Dame Cathedral has grabbed the attention of people the world over as a nation mourns the devastation of its cultural and historic epicentre. Over and above its religious and historical significance, the Notre Dame cathedral in Paris, France, is also home to centuries-old artworks. First responders scrambled to save as many of them as possible when the fire engulfed the building and though many of the important pieces were removed in time, others were destroyed. 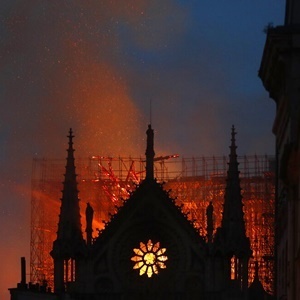 France’s luxury-goods tycoons pledged about $339m to help in the reconstruction of Notre-Dame cathedral after the Paris landmark was ravaged by fire, answering a call from President Emmanuel Macron for a fund-raising campaign. French citizens joined global leaders to rally behind Emmanuel Macron in the aftermath of NotreDame Cathedral fire, giving the French President an opportunity to quell the political volatility that’s embroiled his government. As flames ravaged the iconic NotreDame Cathedral in Paris, far-right activists launched a disinformation campaign.